Location: Beside the Holyhead Road, immediately S of the village, opposite the Saracen's Head Hotel. The milestone was erected as part of the improvement of the London to Holyhead Road undertaken by Thomas Telford, engineer, from 1819 to improve communications between London and Dublin. The poor state of the road to Ireland exercised Parliament from before 1810, and a survey was carried out by Telford in 1811. Monies granted following the setting up of a commission in 1815, but work on this section could not take place until the amalgamation of the seven existing turnpike trusts, authorised in 1819. The road was not completed until the opening of the Menai Bridge, and the construction of the 20-mile Anglesey section in 1828. Telford designed the road formation, and details of ancillary structures including tollhouses and milestones, many of which still survive despite the loss of their information plates. This present milestone may have been re-located from a position in the village. 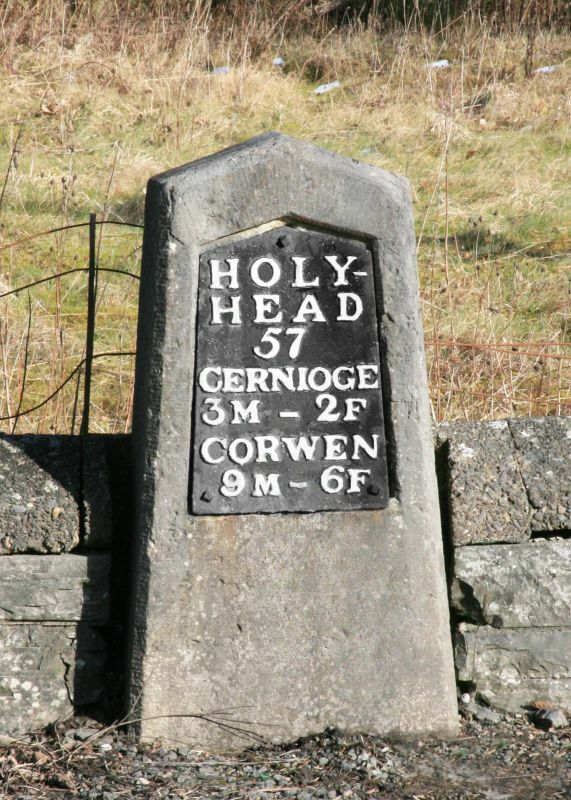 HOLY- / HEAD / 57 / CERNIOGE / 3M - 2F / CORWEN 9M - 6F. Included as one of the important series of milestones erected under the direction of Thomas Telford as part of one of the first modern style major road improvement schemes of national importance. The tomb is located in the churchyard, approximately 2m SW of the Geeler Chapel. The chest tombs are set side by side in the churchyard, at the SW corner of the church porch. The parish church is set in a near circular churchyard on the S side of the village centre. The almshouses stand on a raised bank on the SE side of the southern part of the central square of the village, facing the church. The monument is set in the churchyard, approximately 3m from the chancel on the N side of the church. The memorial stands at the N end of the central square, outside Lloyds Bank, and at the junction of the Llyn Brenig and Llanfihangel Roads. The mill is located on a minor road just off the road to Llanfihangel, approximately 700m from the centre of Cerrigydrudion.